It is a 160W NC Power Supply Module/Adapter/Driver Module, Range of input voltage: DC 6~40.00V, Rang.. It's a 18W Buck Power Converter/Power Supply Module/Adapte, Input voltage: DC 12V/24V (8~35V), Outpu.. It is a 18W Adapter/Power Supply Module/Car Converter, Input voltage :DC 15~55V, Output Voltage: DC .. It is a Car Charging Module/20W Adapter, Input voltage: DC 12 / 24V, Output voltage: DC 3.7~12V (Ada.. It is a 20W Adapter/Power Supply Module/Charging Module, Input voltage: DC 3~35V, Output voltage: DC.. It is a 360W Car Converter/Adapter/Buck Power Supply Module, Input voltage: DC 48V (wide voltage ran.. It is a 240W Buck Car Power Supply/Adapter/Voltage Regulator, Input voltage: DC 48V (wide voltage ra.. It is a 240W NC Power Supply Module/Adapter/Charger, Input voltage: DC 10~40V, Output voltage: DC 0~.. It is high-quality DC 24V (DC 17-35V) to DC 12V 20A 240W Buck Step-Down Converter ,conversion effici.. It is a 24W Power Adapter/Voltage Regulator, Input Voltage: AC 15 ~26V or DC 15~40V ( Input regardle.. It is a 24W Power Supply Module/Voltage Regulator/Car Adapter, Input voltage : DC 15~55V, Output Vol.. 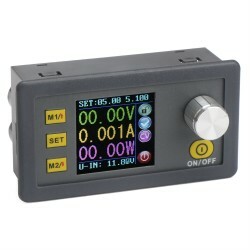 It is a 12V 24V Power Supply Module/CNC Digital Controller + Digital Meter, Input voltage range: DC .. It is a 250W Programmable Power Supply Module/Adapter, Input voltage range: DC6~55V, Output voltage.. It is a 27W Buck Power Supply Module/Car Adapter/Voltage Regulator, Input voltage : DC 13~60V, Outpu.. It is a Switching Power Supply/Adapter, Input voltage:AC 90V~240V 50/60HZ, Output voltage: DC 5V (±0..